We have kittens ready now (2019), and more on the way in the upcoming months. Our litters could include seal, blue, lilac, chocolate, snowshoe, and lynx point kittens. We are now accepting deposits to get on the wait list for these litters. Find us on facebook for the latest videos and photos of currently available kittens. Please fill out our contact form if you would like to place a deposit to reserve a kitten, or if you are interested in being put on our waiting list for future litters. We occasionally have retired queens or studs available for sale at a reduced fee. Contact us for more information. In its first moments of birth, we will "imprint" your kitten by getting it used to human touch, especially in areas around the ears, mouth, toes, and tail. These first moments of life are crucial in beginning the human-feline bond. All of our kittens are hand raised with daily contact from the time they are born until they leave for their new homes. We never keep our kittens in kennels or cages. Blue Eyes Cattery is a FeLV and FIV free cattery. All of our adult cats have tested negative for FIV and FeLV, ensuring that your kitten will be free from leukemia and aids. Kittens are sold with a written health guarantee against genetic diseases. We only use the healthiest cats with good family history in our breeding program. We strive to build up our kittens' immune systems as they grow in the most natural ways possible. At buyer's request, kittens 12 weeks or older are vaccinated for Rhinotrachetis, Calicivirus, Panleukopenia, and Chlamydia (thimerosal-free formulation). All kittens are given a preventative deworming before leaving for their new homes. If you wish to reserve a kitten from an upcoming litter, you may do so by placing a $500 deposit. Buyers can specify the color, gender, pattern, and style of their desired kitten at time of deposit. Kitten selection is done in order of deposits received (first come, first served basis). Our breeding decisions are made based on our wait list, so many of our kittens are reserved before they are even born. We breed for quality, not quantity. The cost per kitten is all-inclusive of spay/neuter surgery, deworming, registration, digital photographs and/or movies of your kitten, vaccinations (if 12 weeks or older at time of sale), and a starter kit of wet/dry food and litter. I price our kittens to offset the expenses I incur, which are extensive because our cats are given the absolute best care imaginable. I have to take into account veterinary, food, housing, litter, supplies, business, and many other expenses which are significantly higher because I choose to breed responsibly. Total all-inclusive cost is $1800 per kitten. Click on the title "Investment" above for a detailed explanation and breakdown of price. Kittens can be picked up at our home, or I can personally hand-deliver kittens within a limited area (additional cost may apply depending on location). We do not ship our kittens alone, but they can fly home with you under your seat in the plane cabin. The closest airport is BWI, but DCA and IAD are also nearby. Kittens are placed in their new homes once they reach 2 pounds, which normally occurs between 8-14 weeks of age (depending on litter size and other factors). Blue Eyes Cattery is a closed cattery, meaning that our cats do not have contact with cats from other households or the outdoors, and visiting cats are not allowed in. All parents are on premises, and our males are not available for stud service. This policy ensures that our kittens are not exposed to unknown pathogens and can safely grow up in the healthiest environment possible. We encourage buyers to take care of their kitten's teeth regularly. Periodontal (dental/gum) disease is the most common disease in cats and can lead to pain, bad breath, and tooth loss. Chronic untreated infections of the tooth and gums can spread to the heart, liver, lungs, and kidneys. To prevent periodontal disease in your kitten, we recommend home brushing with CET toothpaste. All of our cats love the CET poultry flavor! All of our kittens are spayed or neutered before they leave our cattery. Many vets charge $600-800 for this surgery, and people often forget to take that cost into account when looking to purchase a kitten. When you get a kitten from us, the surgery cost is included, and the procedure is completed before they go home with you. This ensures that your kitten is fixed at the proper age before their hormones kick in (leading to behavioral & physical problems) and allows you to focus on enjoying your new kitten rather than vet appointments and surgical recovery. Our siamese cats and kittens are extremely affectionate, outgoing, and friendly. They thrive on human interaction and love being around people. Siamese are extremely loyal to their owners and make wonderful companions. 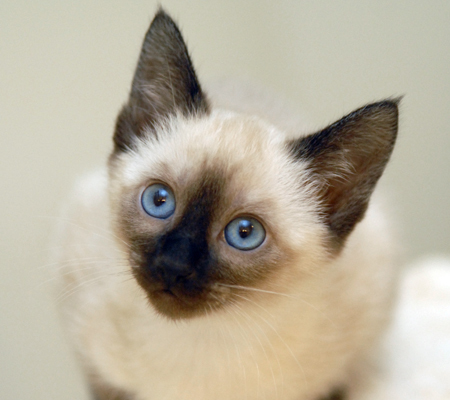 The Siamese breed is said to be the most "dog-like" breed of cat. They are very smart and can learn to fetch, walk on a leash, and even use the human toilet. Siamese love to "talk" and will carry on a conversation with you. Our kittens are great with kids and make excellent family pets! They sleep in bed with us, normally under the covers or on our pillows! 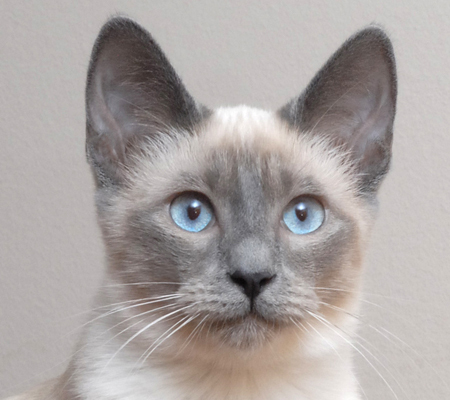 We primarily breed the four traditional colors- Seal Point, Blue Point, Lilac point, and Chocolate Point. We occasionally have lynx point and snowshoe kittens available. 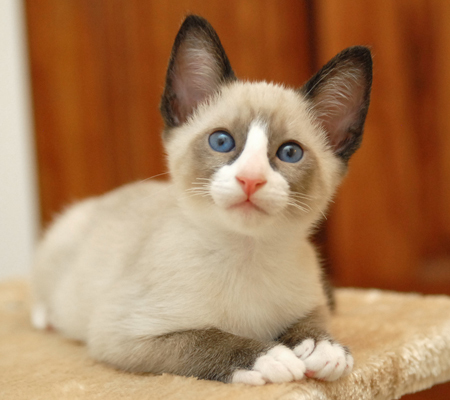 There are three styles (shapes) of purebred Siamese cats- Wedge, Classic, and Applehead/Traditional. Wedge have a small body, big ears, and almond shaped eyes. Applehead/Traditional have a large body, a fuller coat, and round head. Classic is in between, a blend of the best features of each type. The majority of our litters are Classic or Applehead, but we also breed Wedge kittens occasionally (depending on demand).